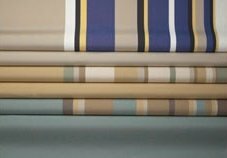 All of the awning fabrics we use at Samson Awnings are from top quality solution dyed acrylics from brand name European manufacturers. Dickson® fabrics are solution dyed acrylic fabrics and are made from 100 percent solution-dyed acrylic yarns. Solution-dying is the process of adding color to acrylic fibers during manufacturing while they are in a liquid state. Colour goes all the way through the fabric not just on the surface (like canvas for example) so it looks beautiful year after year. Since solution dyed acrylic fabrics are woven, they are also highly breathable, which is why they dry quickly with only air exposure. An inherent characteristic of solution dyed acrylic fibre is that it will not support the growth of mildew or fabric rot, as a natural fibre such as canvas (cotton) or even vinyl will. All of our solution dyed acrylic fabrics have been tested and proven to provide up to 98% UV protection from the harmful effects of the sun depending on depth of colour. Whites and lighter coloured fabrics provide less protection than darker fabrics, which have more depth of colour. This protective factor is inherent to the fabric and will not be reduced by usage and/or fabric exposure to the sun. In addition lighter fabrics will always repel slightly more heat than darker fabrics similar to white versus black paint on a vehicle. With our complete selection of over 400 solution dyed acrylic fabrics, the outside of your home can be just as beautiful as the inside. Solution dyed retractable awning fabrics are the perfect way to enhance the exterior facade of your home. And with our vibrant gallery of distinctive colours, styles and patterns, it won’t be hard to find a shade that’s right for you. Our solution dyed acrylic fabrics fit every conceivable awning style on offer. Whether you want to extend your living space, add shade to your patio or deck, or complement the exterior aesthetics of your home, our solution dyed acrylic fabrics give you a worry-free solution. All of our solution dyed acrylic fabrics are tough enough to handle the sun, the wind and the rain. And with a wide array of colors to choose from, it won’t be hard to find one that complements your home.